170XL050 Timing Belt. BANDO: 17 inch Length OC. 85 teeth. 1/2" Wide. REPLACES: Pegasus Water Pump Motor Belt 166-01-170. Jason 170XL-050. 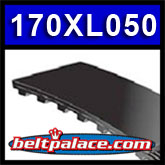 170XL050 Belt. PREMIUM BANDO USA TIMING BELT. 17” Length OC (432mm). 85 teeth. 1/2" (.5 inch) wide. 1/5” (.200”) Tooth Pitch. Replacement “XL” Timing Belt. Popular replacement belt for power equipment such as belt sanders, coil winding machines, water pumps, power tools, and robotic equipment. Pegasus Water Pump Motor Belt 166-01-170, 1/2" Wide, 85 teeth, Polyester Aramid Cord. Gates, Browning, Goodyear, Dayco, Richeng (low grade), Bestorq - 170XL050 belt. Lathe Model NR BV-920 Drive Belt (black rubber). 170XL050-UG Belt. POLYURETHANE BANDO USA TIMING BELT. 6” Length OC (432mm). 85 Teeth. 1/2" wide. Replacement 170-XL-050-U Timing Belt.